We make ACCOUNTING easy for you! The Australian Government encourages you to take responsibility for your own retirement destiny. Superannuation can be used as a central core to your financial strategy. More people are realising that they can take control of this very important investment through the use of Self Managed Superannuation Funds (SMSF). A SMSF allows you to take control of your investments, gives you significant tax benefits and reduces administration fees. But ... superannuation law is complex and requires personalised planning for each individual. Unless you know the legislation, you could very easily fall into traps which will penalise you dearly. 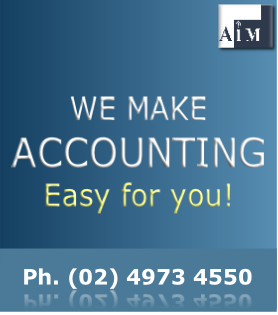 At AIM Accounting, we will help you to set up your own superannuation fund. We effectively take away your administration worries so you can concentrate on where and how you want to invest your assets. Imputation credits on dividends can reduce the overall tax you pay, excess credits are refundable.